5 mg Ivermectin per mL. Broad spectrum pour-on enters the bloodstream through the skin. 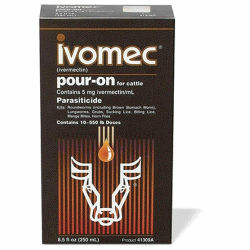 Wormer is effective against mature and immature stages of internal and external parasites including roundworms, lungworms, grubs, mange mites, horn flies, sucking lice biting lice, and sarcoptic mange. Measuring cap makes dosing quick, easy, and accurate. Apply along back of animal at 5 mL per 110 lb of body weight. Not cleared for female dairy cattle of breeding age. 48-day slaughter withdrawal. 250 mL will treat 5,500 lb. 2.5 L will treat 55,000 lb. 5 L will treat 110,000 lb. 1,000 mL will treat 22,000 lb.